Every AV project is different and distinctive and PGF Integrations treats each project, whether new build or upgrade, as unique and deserving of the highest level of attention. When we start a project, we start with YOU the client. We get to know you and your organization so we can help you create a full and complete game plan for your Sound, Lighting, Projection and Camera Systems. Many times AV Systems are done in stages. Even if you do not build it all now, we want to make sure you have the infrastructure in your plan to support future growth and expansion in your overall AV plan. We meet with you and learn about your organization and the audio, lighting, projection needs that you have. Discuss solutions and if needed provide graphics or 3D models or fly through video to give you visualization tools so you have something to show your team, committee or congregation. 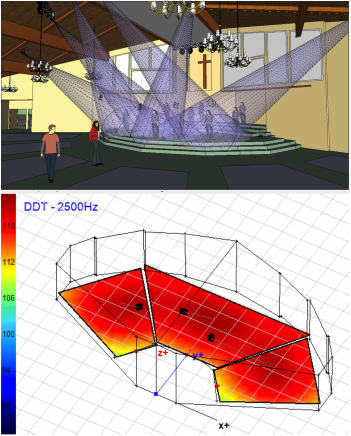 We utilize acoustic and 3D modeling to analyze acoustics and assist in perfect selection and placement of speakers. With our personal Design Build approach there is one source for sound, lighting, projection, and acoustics, without paying a separate consulting fee, this SAVES YOU money! We coordinate with electricians and other trades needed to complete the project, to insure a system that delivers with excellence. We design systems for all ranges of budget and technical complexity. Whether you are a smaller church or school with simple sound needs or a large organization with significantly more advanced sound requirements, PGF Integrations can DESIGN and INSTALL your dream system.